Pre-K Pages is hosting a Book Study Blog Party.When I saw the opportunity to connect with other bloggers and teachers while learning more about literacy in early childhood, I was stoked! Basically, a bunch of bloggers are studying the same book this summer and posting reflections. This is just the kind of professional learning I have been looking for online. I was also excited to see the book selection was a new book by Fountas and Pinnell called Literacy Beginnings . Gay Su Pinnell and Irene C. Fountas are regarded as literacy gurus... at least in this neck of the woods. While I've studied some of their books for older grades, I was excited to get to read a book that related to my child's stage of development. Many of the bloggers who are participating in this study are seasoned prekindergarten teachers. I am not. In fact, as many of you know, I am a stay at home mom of these two darlings. 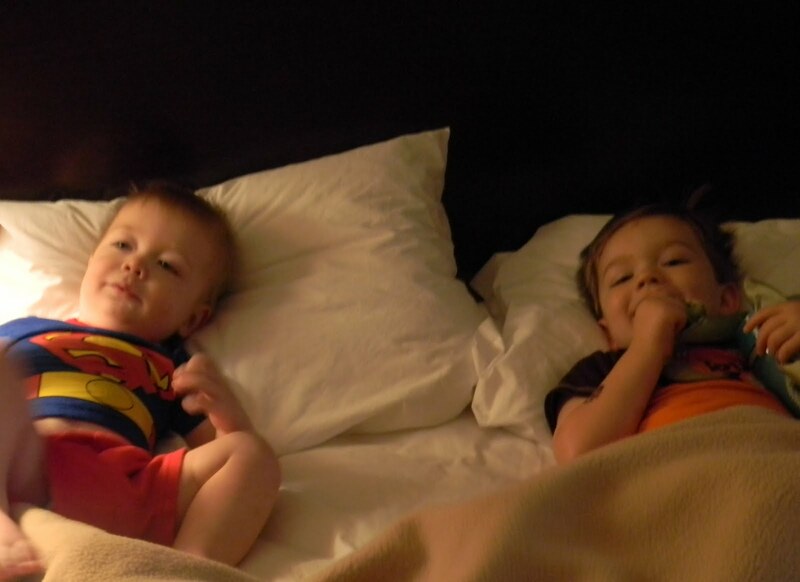 Tyson (1 1/2) and Logan (3) hang out at our hotel this weekend! I think it will be interesting to reflect on how I can use the strategies in this book to provide a more print-rich environment in my home. While I am currently staying home, I do plan to return to the classroom eventually. I hope to read as much as possible in these years that I am "off" work (ha, ha) so I will be well prepared when I go back to work. Connecting with other professionals both online and in the "real" world, should be beneficial too. After reading the introduction and Chapter 1, I've already found some things to reflect on regarding my home. The authors encourage teachers to observe, observe, observe their children, and to link to what a child already knows. "The foundation of our teaching is our understanding of the unique development of each child, as we bring our instruction to the cutting edge of that child’s development.We provide opportunities for growth while carefully observing children’s language, reading, and writing behaviors" Sometimes it's easy to get caught in an activity that interests us as the parent or the teacher, or perhaps a project that is just "cute". Ever picked a project because it would make a great blog post? Guilty. When I'm looking for a program for my sons, I want to find one that focuses on understanding the individual child instead of just following a prescribed set of learning objectives. Children need experiences that help them realize that reading and writing are valuable tools-- and are worth working toward. Some of these experiences might include read alouds, labels, exploring letters and sounds to determine relationships between the two, rhyming and language play, and playing with writing. One area that I would like to improve on, is providing more labeling to make our home a more print-rich environment. I am going to look for play areas where labels would naturally fit. The authors mentioned creating menus in your play kitchen or letting your child take orders before an evening meal. These would be fun ways to make literacy learning a part of your every day life. Those are the two things that jumped out at me from the first chapter. I can't wait to read more of this book as well as reflections from other educators. You can join in on the conversation by linking up a blog post here or simply commenting to share your thoughts. I would love to hear your ideas! Thank you so much for participating Jackie! I'm thrilled to have a parent involved, you will bring a lot of unique insight to our discussions! I think the home is a very natural place to include labels and print.